Hi I have recently downloaded the Visualiser. Thank you for the great tool. However I am trying to understand your contribution calculations. Thank You for your comment, much appreciated. Contribution is simply $P&L / Equity. As account grows and shrinks, Absolute $P&L is not as representative. furthermore, if You have inflows/outflows in your account, then You probably would be better off using contribution instead of P&L. I have not added time series like modified Dietz, or benchmark, or even currency in the contribution formula so as to keep it simple. Tip: have a look at the CSR on the Table page. LOok at the component. This is particularly useful. If You want to find your style, I would recommend You start with a long trading history so as to understand your style. does it matter if I enter absolute P/L instead of returns in the columns avg-win resp. avg-loss? I don’t calculate returns because I am only trading on margin. I suppose You talking about the PivotTable. Please feel free to replace the field in the table definition. To be honest, I replaced Profit by contribution because i also trade leveraged and monitor a rather short timeframe. PS: Just a question out of curiosity. What is your position sizing algo ? How much of your equity are You risking ? Let me know if You experience difficulties. Please read a post about the two types of strategies. Woah! I’m realy oving the template/theme of this website. to get that “perfect balance” betwren usability and visual appeal. I must say you’ve done a great joob with this. Additionally, the blog loads extremely fast for me on Chrome. post here att my residence. In your experience of development systematic trading strategies, what are the “average”, “good”, and “great” values for CSR? Average CSR is 0.97, at least the one I have measured on some portfolios throughout the cycle. Digging down a bit deeper, this is because a lot of these portfolios have styles: growth, value, small-mid /large carp etc. Markets favour those styles and for some time, managers can touch MC Hammer. They think they understand Jesus, and then they wake up on the cross. Style goes out of favour for some time. A good CSR would be between 1.2 to 1.6. I am around 2 at the moment but longer time frame i am close to 1.3. A great would be 2 and above. Now here is the trick to ge t there. If Your tail ratio is above 1 and your Profit ratio is above 1 too, then the most powerful force in the universe, compounding, kicks in. What usually happens is below 1 and the other compensates. I am writing about short selling, trading edge and mental edge. What are your biggest challenges in trading ? Thank for a very clear explanation, Lauren. 1. Trading edge: Short-selling in equities, especially with a trend following style. The goal is not just for diversification (currently most mean reversions in my portfolio), but to learn how understand market better in a quantitative framework. 2. Mental edge: How to incrementally raise my emotional intelligence, starting with trading since it’s more concrete, i.e. the P&L is objective. 1. 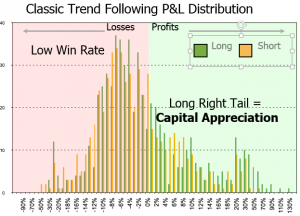 Trading edge: trend following style. I assume You are not doing options. Then 1. define the trend 2. wait for rebound to roll over to enter 3. take risk off the table as it is about to rebound again. Do not hold the entire through the rebound as it often goes past entry point. 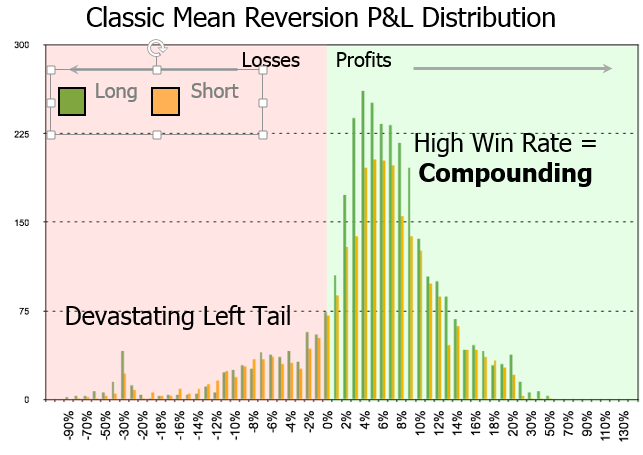 If You are mostly mean reverting on the long side, then i would suggest a mean reversion approach on the short side as well. Now (+/- 1-2 days) is about the right time to start shorting. A lot of ETFs have had straight run-up for 13 days consecutively. They need a break. 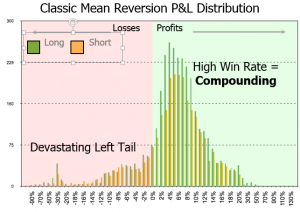 Mean reversion short selling is actually easier than trend following. 2. Mental edge: Are You familiar with work of Rande Howell ? Rande says that P&L is a reflection of inner alignment. I would highly recommend his stuff. He does some unique work around Pearson Marr and Jungian archetypes. Calm.com is a fantastic App. I hear You. I wish I was more advanced spiritually and mentally. Once again, thank You for sharing. I really appreciate and value your comment. Wonderful, what a blog it is! This web site gives helpful facts to us, keep it up. Pretty cool article. I own a trading analytics company called Trademetria (www.trademetria.com) and it is always great to see clever ways to not only find an edge but to quantify it. I will definitely experiment with the trading edge formula you mentioned in the article as well as the visualiser. Como vai voce? Tudo Bem? I am writing a book on short selling: “the virtue of short selling”, why is short selling the most valuable asset class, your pension best friends and how to develop a trading edge. If You like the stuff on trading edge, then You will probably like the book too. More importantly, it is written in a funny easy to read way. There are quotes from the Great Chinese philosopher Bruce Lee, the martial artist Mother Teresa, the great American poet Mohamed Ali. Secure Capital. I ddo have 2 questions for you if you do not mind. your linkedin profile, Facebook page oor twitter feed? The Trading Edge Visualiser was built using Metatrader 4 OrderLog. Does this mean I have to have Metatrader 4 installed to use this? Now, I do not want to reverse engineer your strategy. I do not want to piggyback and trade on your ideas either. I only want to help. Best thing is to send a file of closed old trades. This is all logical but I am having trouble with exactly how you define and calculate “Tail Ratio’ and ‘Gain to Pain’ Ratio? Could you provide a formula like the one for ‘Trading Edge’? 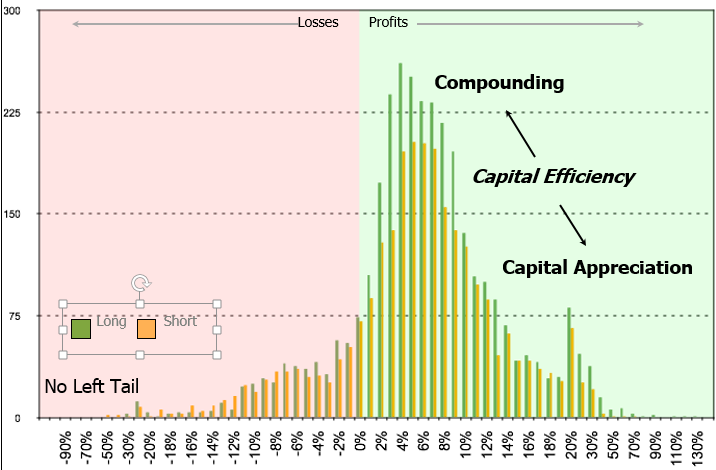 The ratio of total profits to total losses is gain expectancy/trading edge reformulated as a ratio. 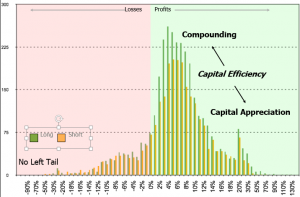 Trend following strategies fail because profits cannot compensate for the multitude of small losses. Thank you for the quick reply to my request for the formulas. When I read your response I realized this all dovetails nicely with Nicholas Taleb’s (Of Black Swan fame) book ‘Antifragile’. Trend Systems would appear to be more anti-fragile. If you have not read his work, antif-fragility refers to things that actually benefit from unexpected shocks. ie right tail events. I try to trade both methodologies, since at times trend following is just not what the market is rewarding. 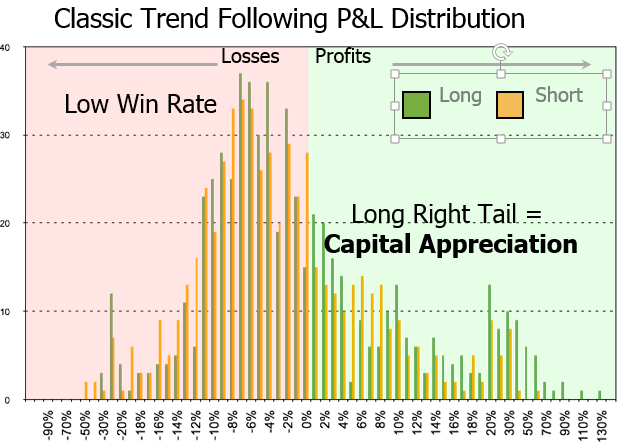 So I really like your ideas for extending the right tail by keeping a portion of winners longer than perhaps traditional reversion strategies suggest. In the upcoming book, i explore techniques to tilt the trading edge according to one’s dominant style. The idea is that some people are inclined to follow trends, others are more prone to trade mean reversion. Example, growth guys trade trends, while value dudes trade mean reversion. An ideal distribution would blend both styles. As You said, sometimes the markets reward trends, sometimes mean reversion. Since market participants have different mindsets, they need to rewire their thinking and incorporate different techniques. The four horsemen of apocalyptic position sizing used by professional inves... What programs are usually used to back-test trading strategies?